Artist Durga Kainthola may very well be India’s answer to Andy Warhol , exhibited her paintings in a Solo exhibition at gallery 7 in 2005 “The Art Factory 2" ,tribute to the great American pop artist Andy Warhol. The modern artist’s first International Solo Exhibition in the year 2004 at Holland Art Gallery, Amsterdam" Art Factory-I ". The organisers of the exhibition were overawed by the universal appeal of Kainthola’s miniatures in gouache on hand-made paper and bought all the fifty works she exhibited .The gallery made 200 silkscreen of one of her work . 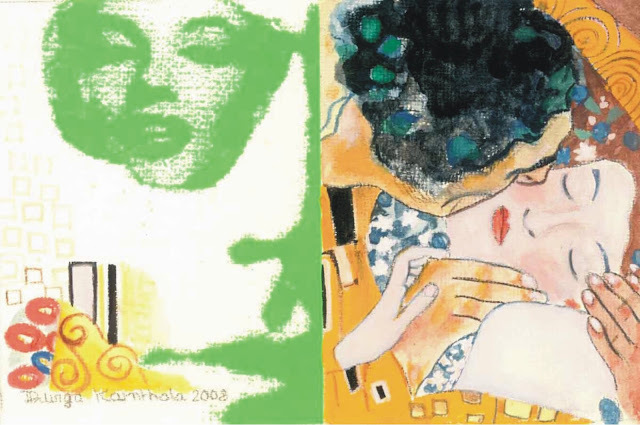 On her admiration for Warhol, Kainthola says, “It was in 1982 that I first saw a Marilyn Monroe diptych by Warhol in a book at the Sir.J.J.school of Art library.However, understanding the spirit of Warhol’s work and letting it seep into my work was a journey My miniatures is a culmination of that journey.” Like Warhol, Kainthola too keeps the context of her work contemporary while Warhol’s portrayals ranged from Monroe to politics to Campbell soup cans, Kainthola’s range from New York burning 9/11 to the Myriad moods from all over the world and India at it's best. side of life. “My work s grounded in history, but its context is contemporary life. I am a firm believer in letting my work speak for itself,” observes Kainthola of the stimulating juxtaposition of ancient history and contemporary symbolism in her work.The artist’s canvas boasts a varled vocabulary. Picasso’s Guernica, Saddam Hussain’s hand holding up a gun, Vermeer, Amrita Shergil, Aishwarya Rai, Andy Warhol, Marilyn Monroe, Salvador Dali, Shakti, Nefertiti etc are all deeply entrenched in her renditions. So what prompts Kainthola to depict a particular personality or event in her work? “They Have to capture my imagination before I can capture them in my art,” surmises Kainthola succinctly. My work is documenting history as a reflexion of the process of change: Exploring myriad levels of visual imagery, juxtaposing iconographic detail drawn from the ancient and modern art both Indian and from the west, then moved into the fluid realm of active, syncopated three-dimensional visualization sequencing idiosyncratic language and perception. This journey into multi-media, moving imagery carries the broader dimensions of energy infused with contemporary metaphor. Mirrored in the highly polychrome written and painted signboards, modern enactments of miniatures, illuminated neon lit sign, the quotidian transforms into the surreal. Inspired by the works of not just the great artists of the world but by popular culture as well. Relating to images that impinge on my consciousness with an analytic eye and a wry sense of humour. Thecontemporary miniature in gouache titled “Warhol and the History of Art” form part of an ongoing series since 2001,incorporating elements of theatricality of iconic figures from several epochs and cultures. With each passing years, my subjects of popular images have gradually diverged from painting to social statements wherein female beauty with time has metamorphosed into a marketable commodity, widely advertised across the globe under the thinly veiled guise of contests by multinational corporate and women magazines.Many of us are conditioned within the patriarchal mindset . Exploring multi-media into my work of art, through new media my work has evolved to a spontaneous and dramatic re-interpretation “Samkaleen Adunik kala”. Durga Kainthola graduated from Sir. J. J. 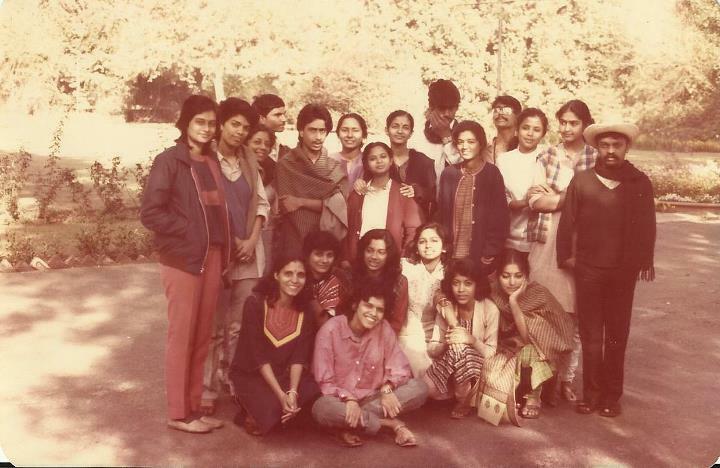 School of Art in Bombay and post-graduated at Maharaja Sayajirao University in Baroda, India. 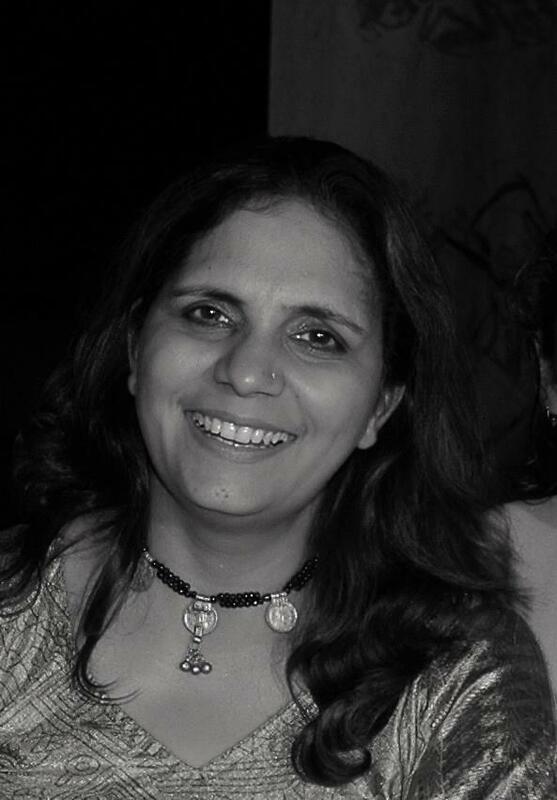 Her paintings have been exhibited throughout the past 20 years all over India and abroad. Her recent solo exhibition was held in Amsterdam and Hong Kong. 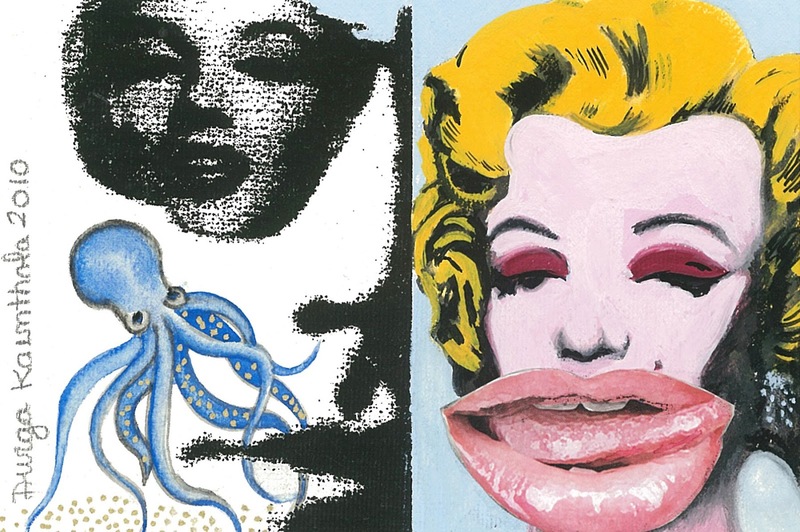 One of her source for inspiration is the Pop Art movement of the 1950s in the US and UK. She explored a wider vision of the world where mass media, advertising and popular culture mingled with history, be it film, politics or soup cans. Kainthola has been described as “India’s answer to Andy Warhol”. She lives & works in Delhi. Portraits tell stories. They capture and freeze moments in the past to form part of the present and show the way to the future. Self- portrait, portraits of artists, mythological characters and creative persons from diverse fields have never failed to fascinate me as an artist. For me, they define a kind of a visual diary that is not confined within limits of time, space or color but is a continuous process that grows along with my personal growth as an artist. I try to bring across a fusion of contemporary images and mythology. Calligraphy is an integral part of my portraits. I blend print and mixed media to explore the borders of both traditional and modern technology.